When I was a kid, my friends aunt, who was some sort of food scientist, told me that if you looked at an apple with a bad patch on it, under a microscope, you would see that the badness goes far beyond the brown bit, like spreading mycelium or the roots of a plant. This information was told as a warning, to not think it enough to just cut away the bad part and eat the rest, as what lurks beneath unseen might kill you! As I say, I am recalling a childhood memory here to dramatic effect. Needless to say, I have always remembered this advice yet always chosen to ignore it. I was brought up to be made of sterner stuff. I follow a scale of food offness of my own design and ‘it hasn’t done me any harm’. I know that there are others whose standards in this regard are much higher than mine and just in case you are by now doubting my credentials and casting aspersions on my forthcoming artisan preserve venture, I do have an official food hygiene certificate. For 2010, I, along with around 130 others, am taking part in Tigress’ Can Jam Challenge, an idea devised by fellow US based blogger tigressinajam, (see also tigressinapickle). The idea, to choose a different seasonal ingredient each month that can be canned. You can read the challenge outline here. It is all about ‘canning’. In the UK we don’t ‘can’ anyway, we ‘bottle’ and even that is a niche activity. Bottling, in case you don’t know, is a way of preserving food in special glass jars by employing either a hot water bath on the cooker hob or an oven method so the foodstuff is rendered sterile and will thus store in your larder for ever more. Bottling was once popular in the UK, especially during the wartime ‘make do and mend’ era. It went right out of fashion with the advent of the freezer but now seems to be making a come back with the move back to home grown fruit and veg and other eco considerations. As I am keen to know all about it, even though I am generally of the ‘scrape any mould off the top then eat the jam beneath’ school of thought, I intend to embrace the challenge and run with it. As regular readers will already know, I am a passionate jam, chutney and pickle maker, all activities which in the US seem to come under the canning umbrella but that here somehow don’t. Basically putting your preserves through this canning process will make doubly certain that they will keep and not become contaminated. Canning requires the use of special Kilner jars (or Mason Ball jars in the US) which need new seals every time you use them. These traditional style jars, invented in 1842, have recently been reintroduced and I sell them in my shop. Unlike in the US, you can’t buy complete canning kits here with all the bits and bobs you need to get started, but you can buy some of the equipment, the rest you have to improvise. Anyhow, as the year unfolds I will be able to write about what I discover. In order to meet the criteria of the challenge, it does mean that any preserves I make must be processed in a hot water bath, or at least I must say they are! Have you lot in the States not heard of the cellophane circle and elastic band method of sealing your jam? January has a citrus theme. It must be wonderful to pick your ingredient straight from the tree, as some of the other challenge participants are able to do. I had to buy my fruit as none is grown here. Here is my first recipe for the 2010 Tigress’ Can Jam Challenge. 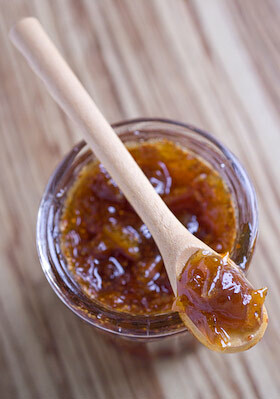 I am a massive fan of traditional bitter seville orange marmalade and this marmalade is just as tangy and fabulous. The lavender note adds an unusual flavour but isn’t at all over powering or over flowery. A few words first on ingredients; choose lemons that are organic where possible and unwaxed always, for this preserve. I had trouble finding dried figs without a load of gloop surrounding them, as they seem to be sold like this in supermarkets for ready-eating. Eventually I found some really nice dried Lerida figs in the health food shop. Dried lavender can vary a lot. I sell Snowshill lavender, grown in Worcestershire, sold by the scoopful in my shop and it is highly scented and natural. If you can’t find one with a good fresh scent, then please just leave it out; if you use it, it wont bring anything useful to the party. Heat the oven to 180C/ 350F/ Mk 4. Wash the 5 lemons and place in a lidded heat-proof casserole with 650ml (1 1/8pts) water, so the fruits just begin to float. Bring to a simmer, put the lid on and place in the oven to slow cook for 2 1/2 to 3 hours. Remove the stalks from the figs and chop them into 1cm (3/8in) sized pieces (or smaller or bigger as you like, remembering they swell up as they reconstitute). Place in a preserving pan with 650ml (1 1/8pts) of water and leave them to soak while the lemons are poaching. Remove the casserole from the oven and lift the lemons carefully with a slotted spoon out of the liquid into a sieve placed over a bowl to catch any drips. Leave them till cool enough to handle then cut each lemon in half and scoop out all the innards, collecting all the pulp and pips in a piece of muslin. Tie the muslin into a bundle and add to the preserving pan along with the poaching liquid and any liquid collected in the bowl. 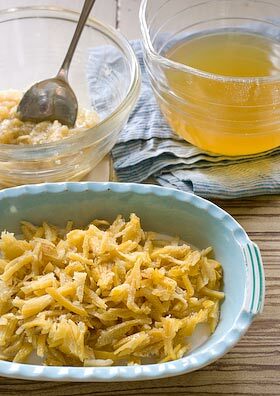 Chop the lemon skins finely into strips and keep on one side. Tie the dried lavender in another piece of muslin to make a bundle and add that also to the pan. Bring to the boil and simmer for 20 minutes. Take off the heat. 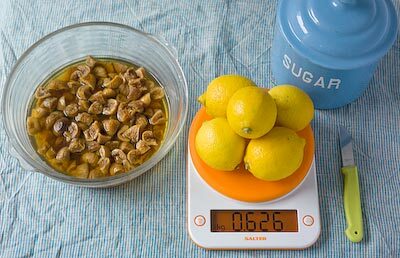 Remove the pulp and pip bundle and add the chopped lemon peel as well as the juice from the remaining lemon, passing it through a sieve to remove any pips if necessary. Add the warmed sugar and stir until completely dissolved then heat, bringing the pans contents to a rolling boil and test for a set after about 10 minutes and every 3-5minutes after that until setting point is reached. If you haven’t ever done this before this means that a blob of the syrup on a cold plate will readily form a skin that wrinkles when you push your finger across it. Take the pan off the heat whilst testing. Turn off the heat, remove the lavender bundle and leave the jam to rest for 15 minutes then stir to distribute the pieces evenly before pouring into hot, clean, sterilised jars. Seal with either waxed paper discs and jam pot lids or the bottle seals and screw tops if intending to hot water process, in which case place the jars in the water bath and process for 10 minutes. 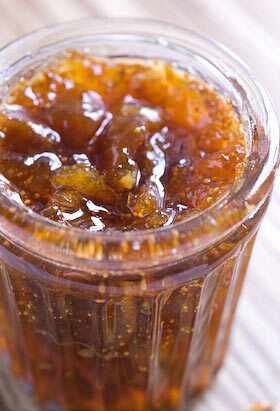 For more info about how to hot water process your preserves, refer to the guide here. Leave your jars until cold and don’t forget to label and date them. I have been waiting for this! Ever since I saw your picture I knew what my dried figs were destined for. Yay! This sounds absolutely delightful. I love, love, love figs. I’d be really interested to find out when you have canning stuff available in your shop (it looks like it is still “coming soon” unless I missed something). I’ve a friend in Winchester that has had the hardest time finding Kilner jars even for mail order. Wow! It does look and sound really tasty. I wish I had the time to make some. That sounds so good! Lavender, figs and lemon. Awesome! I love lavender in jam, and I’ve made strawberry lavender jam before with much success. But figs and lemons and lavender, too! Three of my favorite flavors all in one place, yum. Gloria, this sounds a looks fantastic. I can’t wait to give it a go myself. my, you are a pickle. and you jest because i do know that you popped those babies in a hot bath for the can jam. …plus, i want those jars you sell! Fascinating about the difference in canning approach, I’ve noted that with another UK blog that I read. And, yum, great looking recipe. This is on my to-do list, possibly as early as the next snowstorm (possibly Wednesday). I’m a bit confused, though, about what you’re doing with the lemon. Why is the pulp, etc., in a separate bag? Is the idea that the pulp and juice will seep out, but that anything pithy or membrany will stay in the bag? Tying the pips and pith in a muslin bag will mean that any pectin and flavour that they might contribute is extracted but they are easy to remove so the main body of the marmalade has a translucent and attractive apprearance. As well as trying to make preserves that capture the fresh flavours of the fruit I am always thinking of how to make them look their best. This does mean that it sometimes calls for extra attention to detail during preparation. Many of the canjam posts say how they dislike bitterness in marmalade and also the bits of peel. I am going to try making some recipes in different ways to try and differentiate between bitterness and tangyness as I’m not sure what they mean, apart from that they prefer a smoother mellower preserve? I do love a bitter marmalade that packs a punch. Do let me know how you get on. Mmmm yum! What a great idea to use lavender and figs! I’m enchanted. It’s official. I didn’t realize until your post that the way to my heart is via figs. THANKS for this recipe. I have never water bathed jam. When my children where young I used to bottle peaches, plums, pears and tomatoes by the overflow method. We are all still living with no botulism! I have recently noticed my recycled jam jars are sealing beautifully. What a lovely idea to include lavender! I just planted some in my garden so I’m on the look out for ideas to use it. I also think its really interesting to read about the differences in bottling in the UK. I’m old-fashioned enough that we never used a hot water bath for jam back when I was making it by the dozens with our home grown fruit. We used to melt paraffin wax and pour 1/2″ or so of hot wax on top of our hot jam to seal it. We all lived to tell the tale.. Never had a problem with mold etc and much cheaper than buying lids and screw top rings. What a great recipe! I tried it today, and I love the colour and texture! I made a second batch,and I’ve been enjoying it on rye cackers with a little Stilton. Mmmmmmmmmm! I have just pulled the jars out of the water bath and am very pleased with this recipe! Thank you for sharing! As with every recipe I changed it a little, I halved the lavender and used Meyer lemons, but I am just so in love with the combination! Thank you!